Is it a bird? is it a plane? No it is Supercyclingman. 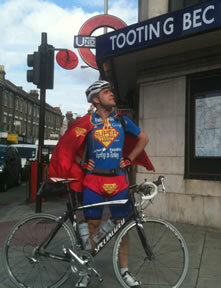 SuperCyclingMan seen left setting off from Tooting in the direction of Turkey, is the alter ego of Will Hodson or Mr Hodson as he is better known to the children at the Brandlehow Primary School he teaches at in Putney, London - and he will be back when term starts kids! “After running a primary school project where children decided what their own ‘little’ heroic talents were, it became clear what my own everyday heroic talents were: fundraising in fancy dress sports challenges! Quite a niche talent....but still a talent I think! I have done a lot of fundraising challenges before this and raised over £12,000 for the World Cancer Research Fund and other charities. 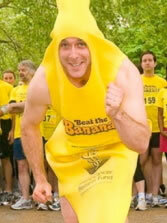 Some highlights have been cycling from London to Monaco in a gladiator costume, running a 5k race dressed as a banana and even doing an assault course in a Christmas pudding suit. Cycling from Tooting to Turkey is definitely going to be my toughest yet. If it goes well, however, who knows what SuperCyclingMan might do next? Tooting to Torquay on a kids’ bike? Turkey to Thailand? Or maybe Tooting to Tooting and go all around the world on my bike? Now that would be something! "We are so proud of our teachers at Brandlehow school. Apart from their already fantastic effort & commitment of teaching the next generation of Putney, amazingly they still seem to find time to raise money for good causes outside of the working school hours. Mr Hodgson has made us all very proud to be part of such a hard working school of teachers and staff and parents..... Well done Mr H, we hope Tooting to Turkey is a success and an epic journey for you to remember. 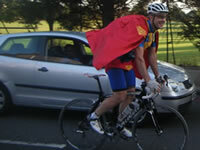 We certainly will"
Follow SuperCyclingMan to see what he will be up to next! You can guarantee it will be something nobody has EVER done before! He is raising funds to be split between The World Cancer Research (WCRF UK) and Parkinson UK - you can sponsor him with Virgin Money Giving.